Numerous clinical studies have shown that social isolation can adversely affect the emotional, mental and physical well-being of older adults. One study even found the health impact of loneliness equates to smoking 15 cigarettes a day.1 For many, hearing loss only adds to feelings of detachment from friends and family. 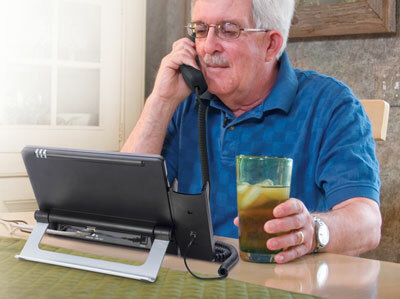 Fortunately, the no-cost2 Hamilton® CapTel® phone enables healthy, meaningful connections by making it possible to listen and read word-for-word captions of everything said to a user on the phone3 – similar to captions on television.4 Often a single connection is all it takes to alleviate the effects of loneliness. 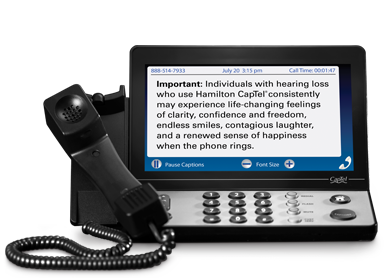 Your patients with a qualified hearing loss can receive a Hamilton CapTel phone and captioning service at no cost. Two versions of the Hamilton CapTel phone are available. It’s never been easier to order a no-cost Hamilton CapTel phone. Once we receive a completed certification form we handle all the details with your patient, including free shipping and installation help if needed. From senior living communities to aging in place home care, the Hamilton CapTel Senior Care Program provides you with the tools to connect older adults with family, friends and healthcare professionals. 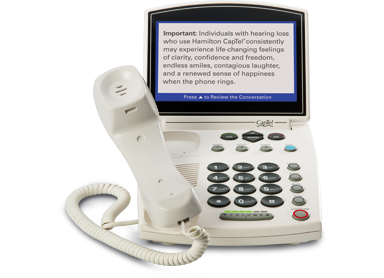 Hamilton CapTel is dedicated to making phone conversations simple and accessible for individuals with hearing loss. Since 2003 we’ve made more than 90 million captioned telephone conversations possible. I’m Ready to Create a Connection! 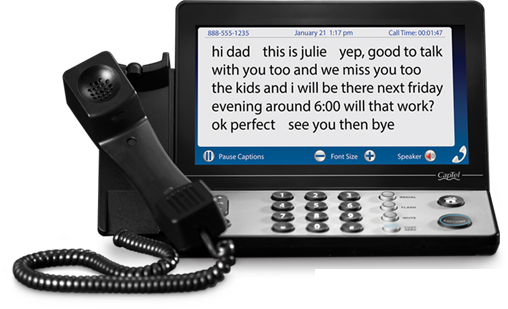 FEDERAL LAW PROHIBITS ANYONE BUT REGISTERED USERS WITH HEARING LOSS FROM USING INTERNET PROTOCOL (IP) CAPTIONED TELEPHONES WITH THE CAPTIONS TURNED ON. IP Captioned Telephone Service may use a live operator. The operator generates captions of what the other party to the call says. These captions are then sent to your phone. There is a cost for each minute of captions generated, paid from a federally administered fund. To learn more, visit fcc.gov. Third-party trademarks mentioned are the property of their respective owners. Copyright ©2018 Hamilton Relay. Hamilton is a registered trademark of Nedelco, Inc. d/b/a/ Hamilton Telecommunications. CapTel is a registered trademark of Ultratec, Inc.